It’s finally happening – the days are just beginning to get longer and the sun is actually rising as you get out of bed…. Spring is right around the corner! For the gardener, that means it’s time to prepare the garden for another beautiful and bountiful season. Start by cleaning your garden: clear out debris like leaves and twigs, and get rid of weeds, making certain that you get the roots when you pull them so that they don’t grow back. 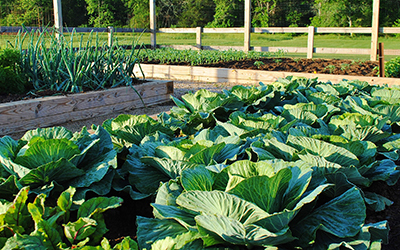 Garden soil, compost and mulch provide a variety of uses in the garden. If you are planting a bed for the first time, garden soil allows you to start with quality soil that will produce wonderful plants. It’s a good idea to till your garden soil about 8” to twelve inches beneath the surface. It also allows you to work organic matter like compost into the soil. When working compost or other material into the soil, use a heavy rake or a cultivator and mix the compost into the top 6” of the soil. Using a 2” to 3” layer of compost around existing plants and in pre-tilled beds adds nutrients to the soil and helps promote plant growth. Compost can also be worked into new beds to create long-lasting soil quality. For well established beds and raised beds that are in relatively good shape, you can “top dress” beds with compost. Mulch is very helpful, preventing weeds and diseases while maintaining moisture and temperature, especially during the occasional spring cold snap. Two to 3” is usually effective. Take care to keep mulch a few inches away from plant stems to avoid rot in the roots. If your lawn needs a little “sprucing up”, topsoil is a great way to boost the power of your soil to create a greener, thicker lawn. Work topsoil 2” into the soil to boost the power of your seed. This is also an excellent time to spread lime on the lawn or perform soil tests to see if there are deficiencies that can be remedied with compost or other fertilizers. This is also an excellent time to fix trellises, beds and boxes, and to add decorative stone features or walkways. 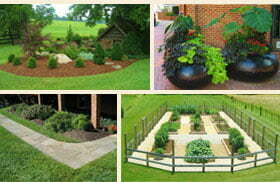 Garden paths should be edged and can be enhanced with decorative gravel or mulch. Beds that meet grass should be edged to avoid “creep” of grass and weeds. Once your beds have been prepared, you can begin pruning and planting! Pruning is best done after the risk of a frost is over. You can begin planting bulbs as early as March, and many seeds can be sown in late March and early April. If you’re impatient to get an early start, you can start seeds inside and move them out when the weather is warm enough. When you transplant, remember that a one inch layer of mulch or compost will help keep new plants moist and protected. Proper preparation of your garden and yard in the early spring make it possible for you to enjoy the growing season with less effort and more reward. If you’re like us, you can’t wait to get back out there and get things growing!